Well, the summer heat is behind us now, the trees are turning all shades of red and the cooler weather is on the way. I have to say it’s been a pretty busy late Summer/Autumn for the CRAB Hermits. It was stinking hot when we were at the Westernport Festival. 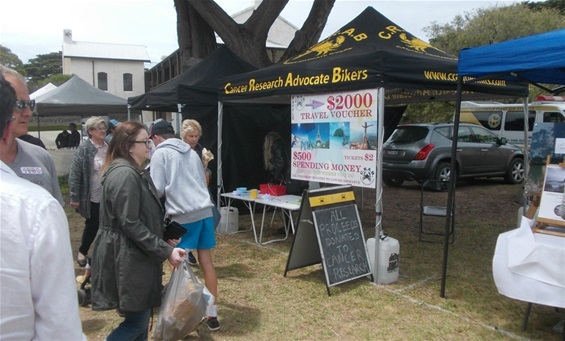 Raffle sales went extremely well and there was quite a deal of interest shown for the “A meander Down The Bay” ride in April but the food sales could only be described as dismal. The issue was that there were just way way way way (did I stress that enough) too many food vendors there and although crowd numbers were up on previous years, there were not enough punters at the festival for the food people to do any good.....but hey, we made a small profit. At the close of the Westernport Festival we drew the Travel Voucher raffle at the Hastings RSL and a cold beer was very welcome after a couple of days in the heat and dust. 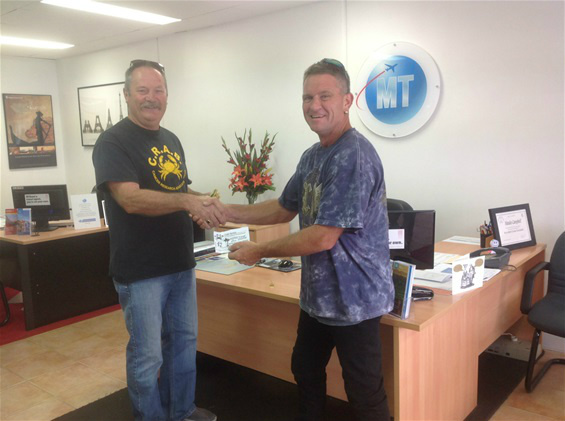 Congratulations to Troy Simpson who was the lucky winner. Troy plans to take his family to Thailand later this year.. have a great time guys. Come March it was “flaps up and chocks away” and all systems go at the Tyabb Air Show. The Hermit team were flat out and the barbie trailer was a smokin’ and by mid afternoon they had sold out of the delectable bacon & egg rolls and the scrumptious handmade burgers. The Air Show was a great financial success for the club. 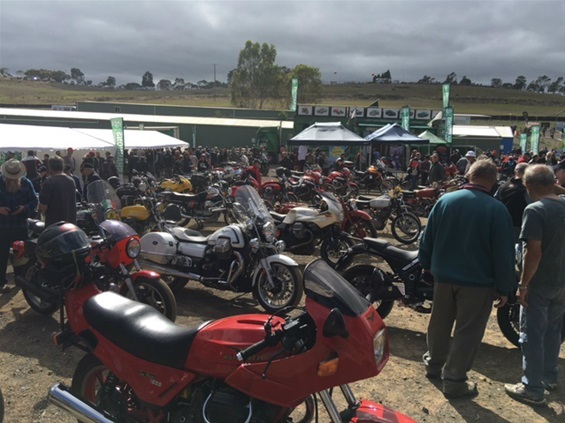 Later in March a few members spent Easter at the Broadford Bike Bonanza and a good time was had by all at the classic bike shows, swap meet and classic road racing, flat track, moto X and vintage enduro. 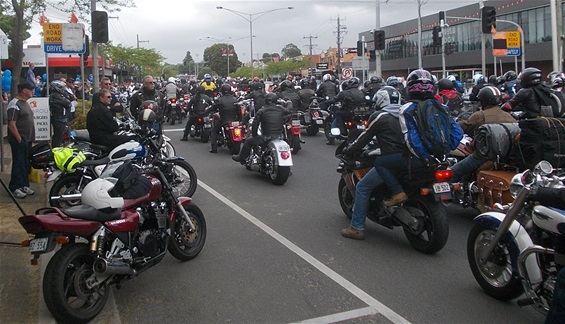 April saw a great dinner/meeting at Matty’s Bar & Bistro, some serious club and charity ride promotion at the Scoresby Motorcycle Only Swap Meet and the second “A Meander Down the Bay” ride. The ride was a great success with over 120 bikes doing the run....about a 50% increase on the previous year. 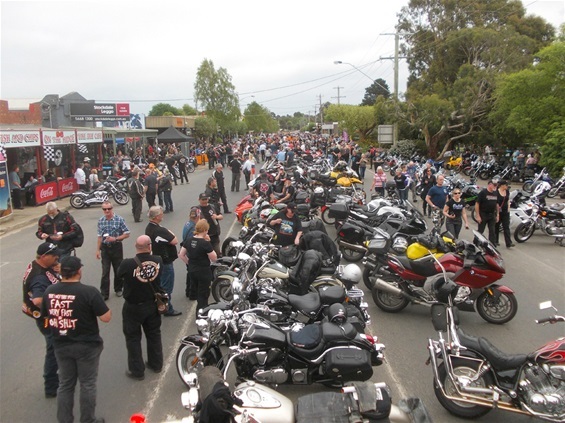 Later in April a couple of Hermits did the ride to Bermagui for the Kingies Bike Show. From what I hear the show was a success. Great work and congrats to the Kingies. Chuck in three new “red plater” members, our regular club runs and some bakery tours to regional Victoria and you would have to agree that things have been scootin’ along. Many thanks to the members who made it happen. The CRAB set up at the Westernport Festival. Club Secretary, Ross Mitchell, presents the lucky winner with his $2000 travel voucher and $500 spending money...bon voyage. 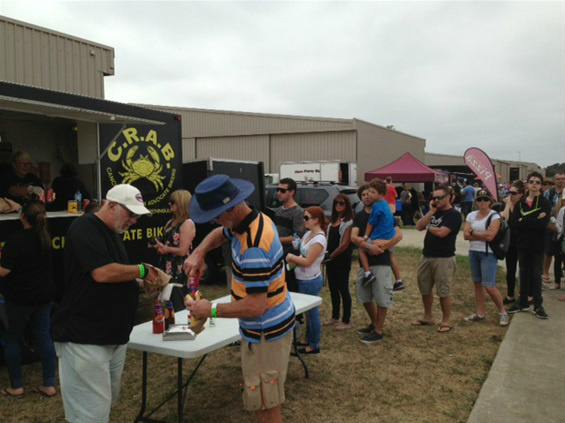 The food line at the Tyabb Air Show. The Classic Bike display at Broadford over Easter. The "A Meander Down The Bay" ride saw over 120 bikes take part. 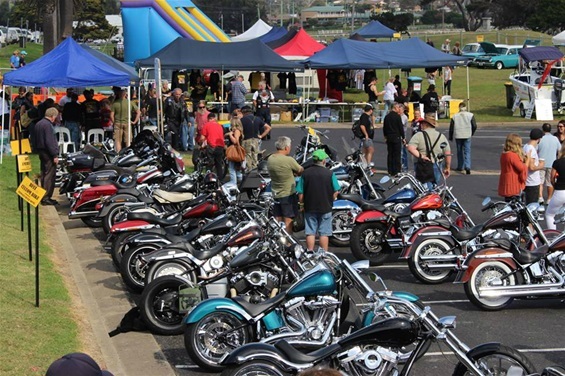 The Kingies bike show in Bermagui was a great success. Well, another Christmas and New Year have come and gone and the Hermits have had a pretty busy year so far. 2015 finished well with a successful sausage sizzle at Bunnings in Hastings. Thanks to Lyn who hosted the 2015 Christmas party and for cooking yet another scrumptious pork roast. January got off to a flying start with our first sausage sizzle at Bunnings for 2016 (even Patti Newton and family complimented us and came back for seconds) and the inaugural Crib Point Bike Show. Around 120 bikes turned up to the show as well as hundreds of onlookers. The guys on the barbie trailer were flat out all morning. A mercy dash to Hastings was in order for more snags and bread and by early afternoon we were sold out. With food sales, entry fees and raffle sales it was a good day for the club. The bike show will be on the club calendar for next year. 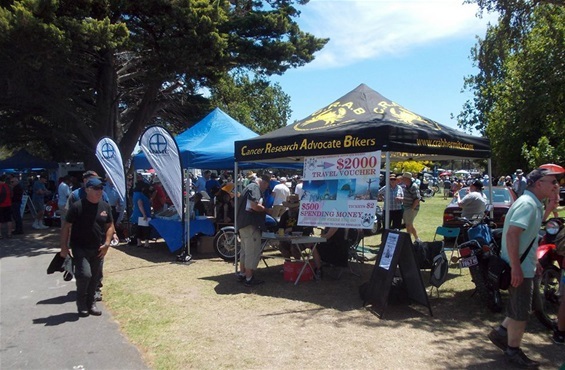 The club was also present at the RACV Great Australian Rally in Mornington for the second year. A couple of the “Red Platers” did the run from Hastings Marina and met up with the other CRAB crew who were at our gazebo at the show. It was a great day out with hundreds of cars, bikes, trucks and caravans on display. The club did well with raffle ticket sales. 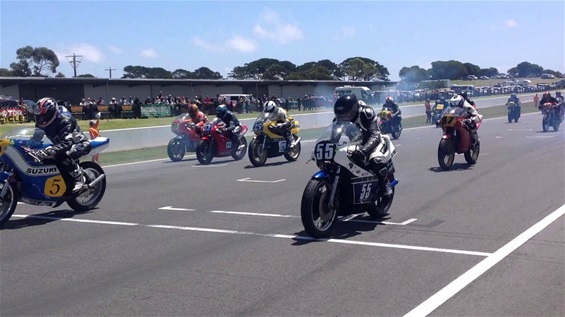 The next weekend saw the club do its annual pilgrimage to the Classic Motorcycle Races at Phillip Island. The Classic is the third biggest motorcycle racing event in Aussie and a must for the veteran bike enthusiast. A great weekend was had by all and thanks to Jim who hosted some of the riders at his place on Saturday night. The Groggy Wombat Rally in Meeniyan, although under the threat of poor weather, saw several Crabarians do the ride and camp out at the rally. Heavy rain overnight didn’t dampen their spirits and a good time was had. A pub meal and breakfast in Mirboo Nth makes the world seem a lot brighter. Throw in some smaller club rides, a couple of wrestling events and a longer ride to the Snowy Mountains and you’d have to say that 2016 is up and running, or should that be riding?.. Well, spring has sprung, the Crabarian winter hibernation is behind us and things have gotten off to a flying start. Our $2500 Travel Voucher Raffle is underway with the club selling tickets at the Mornington, Red Hill and Portsea Markets. We’re hoping to get access to the Centro Group of shopping centres post Christmas for ticket selling as well as several other events across the Peninsula. The food van has been re located to its new home in Rosebud where it’s been used as a base for several catering events at the Night Cap Wrestling Federation. 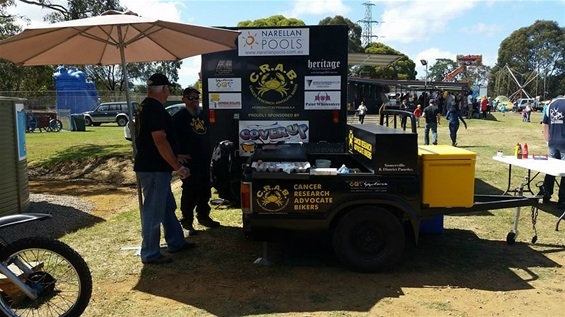 Thanks to Hans, the club’s BBQ trailer is up and running and made its successful debut at the Bluescope Christmas Party. The Bluescope event was a huge financial success for the Hermits as was The Masters sausage sizzle. On the riding scene, the club participated in the Distinguished Gentleman’s Ride with TEAM CRAB raising and donating $2600 toward prostate cancer research. The club was also well represented at the Steven Walter Foundation Ride in the Snowy Mountains. 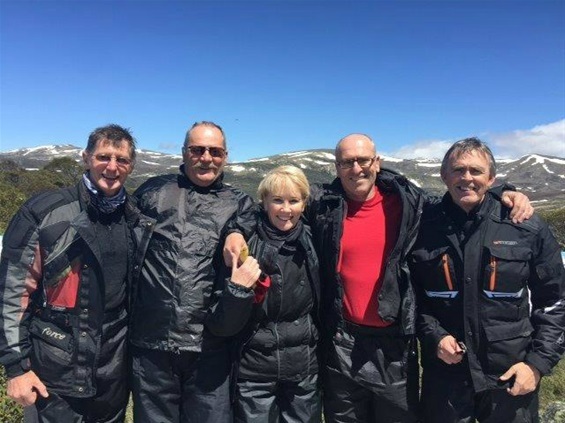 This year the DGR ride raised $2.2 million and the Snowy Ride $250,000. It’s great to see the club supporting these charity rides. The annual Peninsula Toy Run was another successful ride for the club with the usual “mountain of toys” donated by the motorcyclists of the peninsula. Other rides have included The Blessing Of The Bikes in Mirboo North, The 2015 GP Run, The Shirley Grimstone Memorial ride, Simon and Stig’s “Wrong Way Round” tour to Broken Hill and beyond, “Yet another farewell lunch” to Walhalla, and the “Duelling Banjos” Tour of Northern Victoria as well as our regular club rides. And coming up, the club will be hosting the Crib Point Classic Bike Show in conjunction with the Classic Car Show in early January. Also in January we have the RACV Great Australian Rally in Mornington, our annual ride to the Classic Races on Phillip Island and the Groggy Wombat Rally in Meeniyan. See our "Meetings and Rides" page for more details. 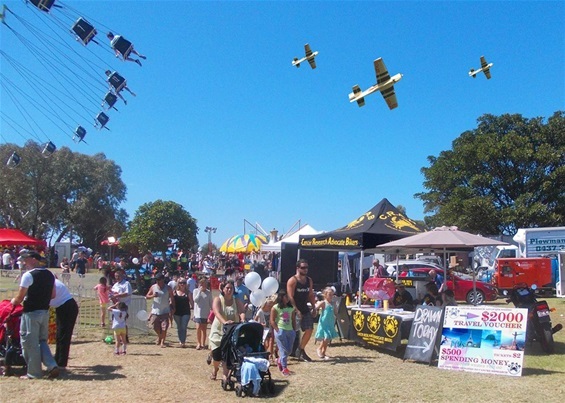 Look out for us at the Westernport Festival, the Tyabb Air Show, at Bunnings and The Meander Down The Bay Ride will be on again in April. It’s all go go go...! 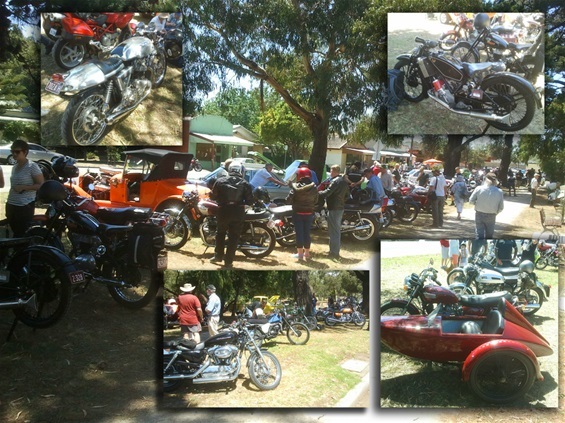 Machines of all persuasions arrived at the Crib Point Bike Show. Ross with winners of the Committee's Choice and the People's Choice awards. The set up at the RACV Great Australian Rally. The Classics turned out in their hundreds for the 2015 Distinguished Gentleman's Ride. Our set up at the Portsea Market. 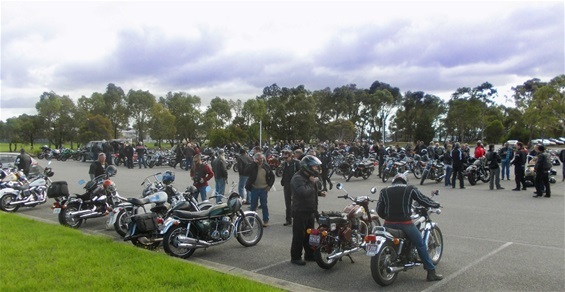 Thousands of bikes turned out for the blessing in Mirboo North. The trailer in action at the Bluescope Christmas party. At the 2015 GP Run. Jim, Ross, Bennie, Steve and Peter at Charlottes Pass on the Snowy Ride.